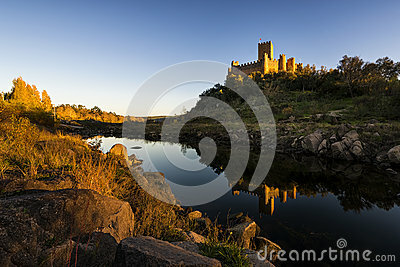 View of the Almourol Castle, in the Tagus River, Portugal. The Almoroul Castle was conquered by the first Portuguese King, D. Afonso Henriques, in 1129 and delivered to the Templar Order. The castle is built in a bank in the Tagus River in the SantarÃ©m District.